Let me begin by thanking you for coming here to meet me during what I know are difficult circumstances for all peacekeepers serving in the Central Africa Republic. It was with immense sadness that I learned of Monday evening’s callous attack on a group of your fellow-soldiers some 500km south-east of Bangui. On behalf of the United Nations General Assembly, I extend my deepest condolences to the families of the fallen and also to the victims’ friends, contingents and to the Government and People of Cambodia for their loss. We also wish for a swift recovery for those who were injured or wounded in the attack. The passing of your comrades represents a high toll for MINUSCA, for 36 peacekeepers have now died in this country since the establishment of the mission. I join with others in condemning the attack on the UN convoy that caused these deaths and casualties. Those who wish to harm our troops should know that we are here in the cause of Peace. We are here to protect the people of the Central African Republic and to allow this country to emerge from the cycle of violence that has plagued it for too long. They should know that an attack on a UN Peacekeeper is an attack on humanity, condemned by every right thinking person on this planet. 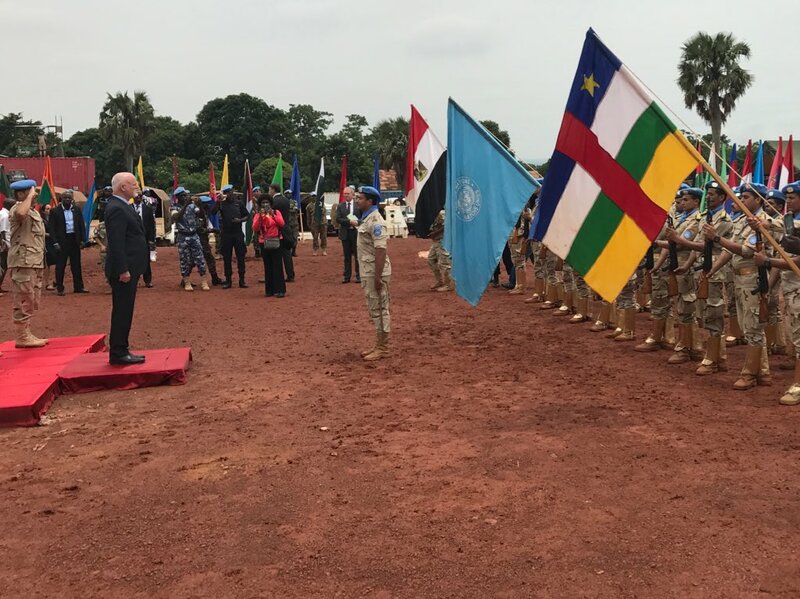 As President of the UN General Assembly, I am here in Bangui to pay tribute to the fallen and to say that their names will forever be inscribed in the United Nations’ role of honor for those who have died in the service of UN Peacekeeping. I am also here as President of the General Assembly to stand in solidarity with United Nations Peacekeepers in troubled times. There are 113,394 peacekeepers currently serving in 16 peacekeeping operations across 4 continents. All of you serving in the blue helmet and the blue beret have our gratitude and our admiration as you perform your duties on our behalf. You do us proud, you do your families proud, you do your countries of origin proud, as you endure the difficult tasks that have been assigned to you under the light blue flag. That pride is rooted in the knowledge that there is no higher human calling than bringing peace to this world. Over the last 8 years, I have on many occasions visited the UN Peacekeeping troops from my home country, Fiji, in Iraq and Syria. These visits gave me an understanding of the immense pressure, that you all face in the troubled spots in which you service. The great sacrifice that you and your families are making in order to uphold the good name and high purpose of the United Nations, can never be overstated. The world owes you all a great debt of gratitude and honour. Your sacrifice keeps civilians safe; your presence secures access for humanitarian assistance; your actions help protect UN personnel, and the commitment of your discipline is vital to sustaining peace in fragile situation. Without peacekeepers, whether military, police or civilian personnel, the United Nations would be a shadow of itself. Peacekeeping is an element story of the UN helping us to drive down the number of people dying from conflicts and to foster reconciliation and reconstruction in many of the world’s troubled-spots. Like any new institutional practice, peacekeeping has not been without its low-points and over the 60 years during which our systems have evolved, we have learned from passed mistakes. We continue to adapt our practices to meet today’s emerging challenges. It goes without saying that all peacekeepers must uphold the highest standards of professionalism. The United Nations has zero tolerance for unethical behaviour, including sexual exploitation and abuse; you are all aware of the uncompromising position of the United Nations in this regard. The Charter of the United Nations is one of the foundation documents of the human family as we know it today. The Charter is the deed that binds us all to strive to save succeeding generations from the scourge of war. It reaffirms our faith in fundamental human rights and in the dignity and worth of the human person. We stand here today under the UN banner that represents the noble purposes of the UN Charter. We stand under it because we believe in the dignity and worth of the human person. As such, we oppose those who do not respect humanity’s worth, who instead bring war and terror upon people, who see fit to kill innocent peacekeepers going about their duties on behalf of the common good. Peace is our calling and many of us have suffered in its cause. Over 3500 UN Peacekeepers have lost their lives as a consequence of their service and this week four more names have joined those who have made the ultimate sacrifice. Be assured that the United Nations will hold their names in a place of honour as long as our institution endures. In that spirit I ask you to now join me in a minute of silence in tribute to the fallen. Thank you for that. Thank you to SRSG Mr. Parfait Onanga-Anyanga to Force Commander Lieutenant General Balla Keïta, and to everyone in MINUSCA for your service to the United Nations and through that service, to the fulfilment of our righteous aim of sustaining peace in the Central African Republic. Thank you for receiving me today.